After a snow storm came in, she was worried she may never see them. However, travelling via bus meant she was able to outrun the cloud cover and the skies opened up a mass of green she’ll never forget. Kirsty was also able to experience some more of the country’s highlights including glacier walks, lava tunnels and the world famous Blue Lagoon. 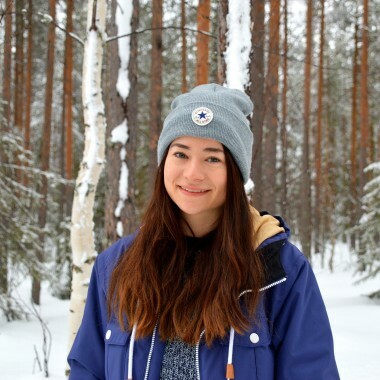 Kirsty really enjoyed her time exploring Iceland in winter and was thrilled when she got the opportunity to venture into the true Arctic wilderness of Finland. Spending three nights in an Aurora Cabin, with a half-glass roof to provide clear views of the night sky from her bed was an experience she’ll never forget. Kirsty’s absolute highlight of the trip, however, was snowmobiling through the wintery forest at night as she went in search of the Northern Lights.